I love deviled eggs more than is decent, but I used to hate making them. It wasn't that I didn't know how to make the filling taste good, or that I hated the smell of sulphur, but the act of peeling eggs almost always sent me into a blind rage. 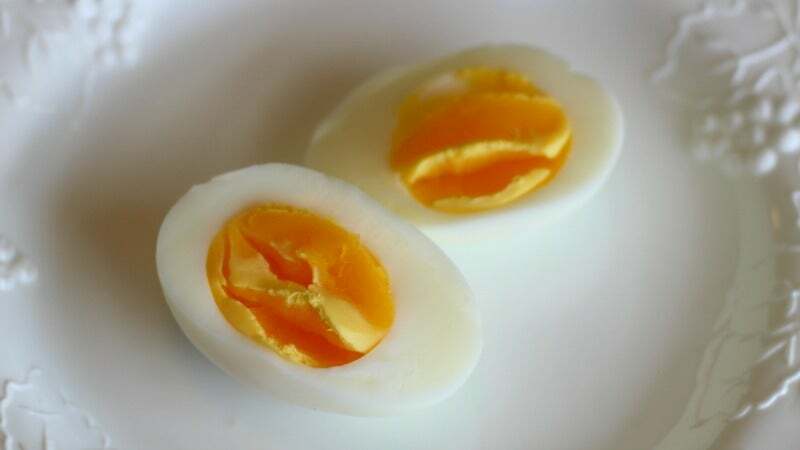 Those days are gone, however, as I now know how to make hard-boiled eggs that will peel without issue. The problem, you see, is that I was taking the wrong advice. Though my Better Homes &amp; Gardens cookbook had served me well in other endeavours, it was just plain incorrect in the matter of hard-boiled eggs. The recipe, which instructed one to place the eggs in a pot of cold water, bring it to a boil, then cover and remove from the heat, was deeply flawed. 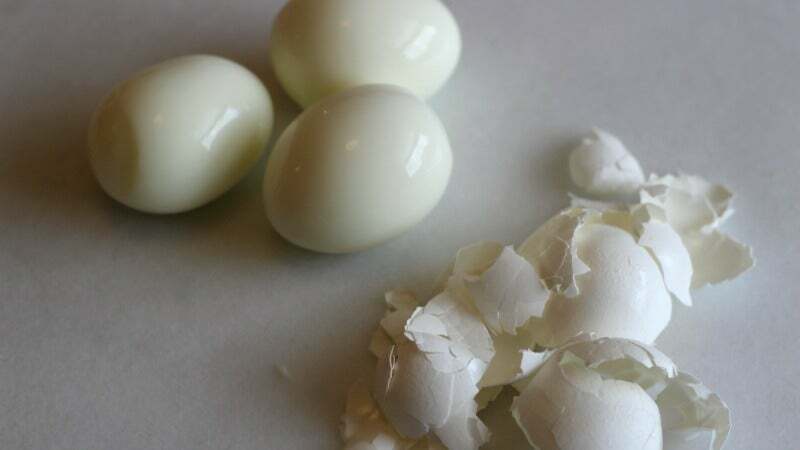 Though the eggs would be cooked "properly," their shells seemed to have severe separation anxiety, and large chunks of white would peel off with them. But then I read The Food Lab's hard-boiled egg treatise, and the heavens parted and my life has been better. You see, a cold start simply doesn't work out well. As Kenji explains, the whites of eggs that are gradually heated bond strongly to the membrane, and that membrane will eff your egg right up. There are two ways I cook my hard-boiled eggs: boiling them on the stove and steaming them in my Instant Pot. Both result in eggs that peel beautifully 98% of the time. That egg crater is not from peeling; it just dimpled that way during cooking. 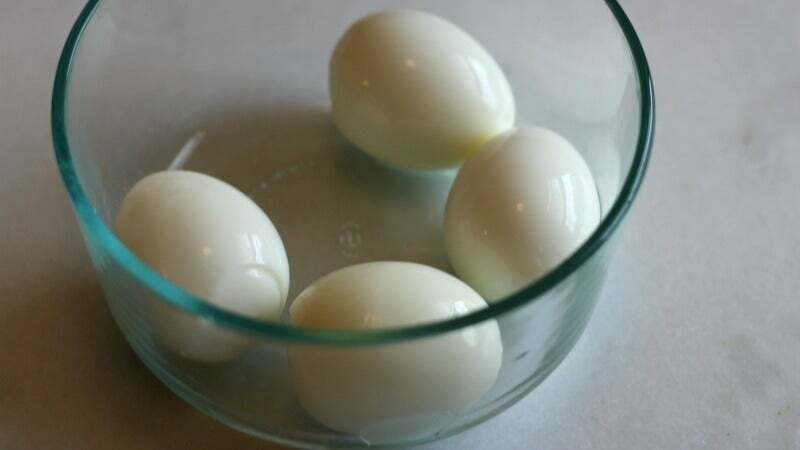 Bring the water to a boil and gradually lower your eggs in. Set a timer for seven minutes and find a short activity to pass the time. (I usually check my social media or take pictures of my dog.) 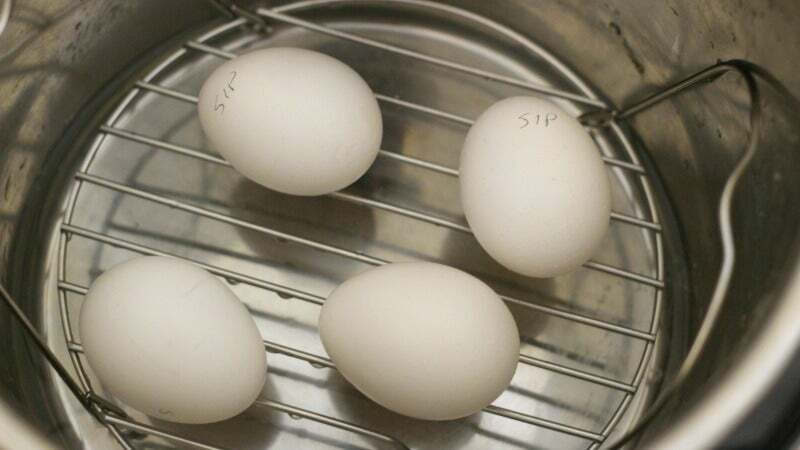 Once the timer goes off, immediately transfer the eggs to an ice bath, and let them chill for at least fifteen minutes. Once chilled, peel the eggs by gently tapping them on a flat surface to form cracks all over, then pry away the shell under running water. 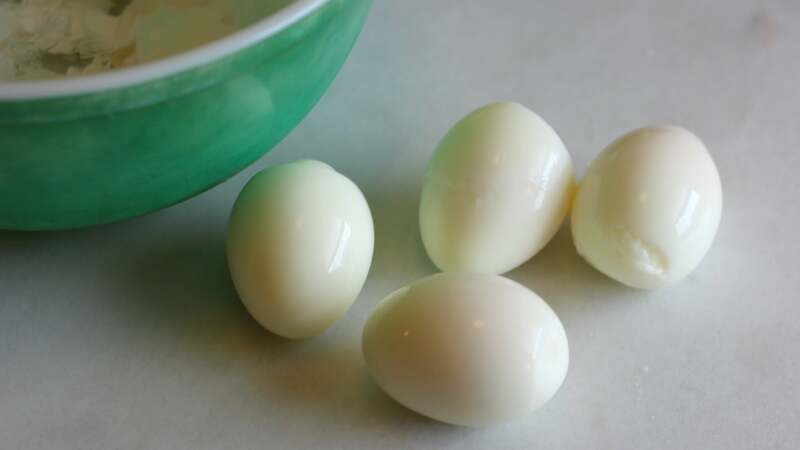 If you like your hard-boiled eggs like I do — firm but still slightly fudgy and not at all dry — seven minutes is the perfect cooking time, but feel free to add a minute or too if you like them a little more done. 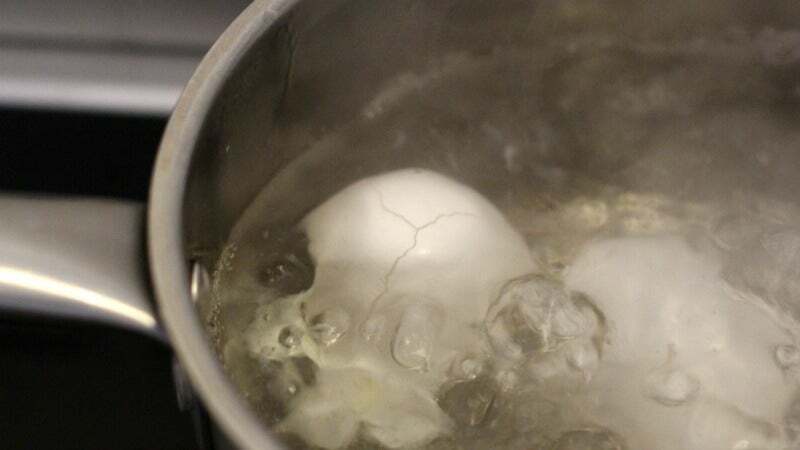 You could cook eggs this way your whole life and be pretty satisfied, but you would notice one small annoyance: one of the eggs almost always cracks upon being placed in the boiling water. A wonky egg that cracked under the pressure. This isn't usually a big deal, as I feed the wonky egg to my egg-obsessed spaniel, but it's not optimum I guess. If you wish to crack down on unwanted egg ruptures, I suggest you try steaming. "SIP" stands for "Steaming Instant Pot"
A trivet or steamer basket. If you're steaming on the stove, fill a pot with about an inch of water, place a steamer basket or trivet down in there and bring it to a boil. Gently lower your eggs into the basket, cover, and let cook for 11 minutes. Remove from the basket and immediately place the eggs in an ice bath for at least 15 minutes. Peel as described above. If you are using an electric steamer, you may have to play around with timing a bit, depending on the model. For the Instant Pot however, you just need to add a cup of water to the insert, place the trivet down in there, and set the eggs on the trivet. Close the Instant Pot, set the release valve to "sealing," and press the "Steam" button. Set the time for seven minutes using the "+" and "-" buttons, and check your Twitter or something. 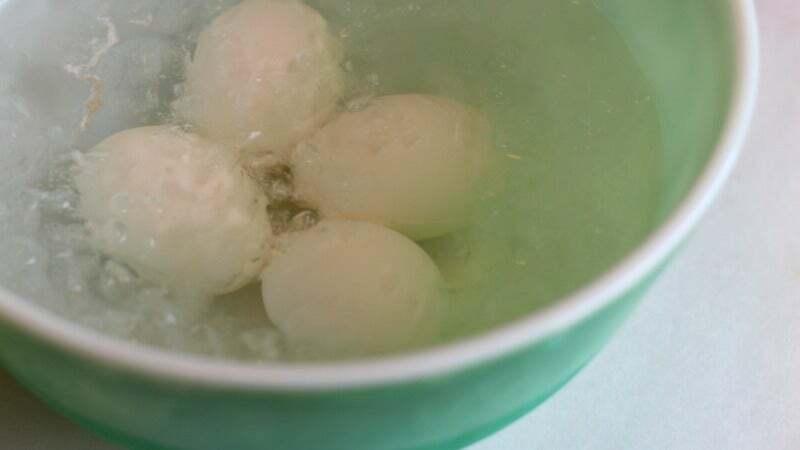 Once the timer has gone off, manually release the pressure by switching the release valve to "venting," then remove the eggs from the pot and place them in an ice bath for at least fifteen minutes. Peel as described above. I have found that, though the stove top eggs are easy to peel, the steamed eggs peel even more easily, and have less dents and dimples than their stove-top brethren. Dents and dimples aren't the end of the world though. I'm a pretty happy camper as long as I get to keep all of my white. - teaspoon to crack the shell and then slide the tip of the spoon under the shell and gently prise it apart. Sometimes you can get it to come off in one satisfying piece. On rare occasions an egg might crack. Maybe the shell weak at one point and the heat put too much stress on that weak point. You can eat that one will you are preparing the other eggs. That is the benefit of being the cook. Sometimes I wonder if LH authors get paid by the word. The author managed to take the task of literally boiling water and turning it into an essay. I am not trying to be mean or rude to the author, the article isn't bad, it's just there is something to be said for brevity when you are instructing someone on how to do something. 1/2 a dozen images and hundreds of words for a simple task seems excessive. Unless this is all for the benefit of SEO or something. perhaps he was confused with the steaming method which says 11 mins? Boiling an egg might seem trivial to you, but for someone who hasn't been taught the basics, this is great advice. Even for seasoned cooks, learning how to do the same task using different methods is very useful. If you've already got a steamer going to cook vegetables or dumplings, knowing that you can pop a few eggs in for the week ahead is a handy tip. 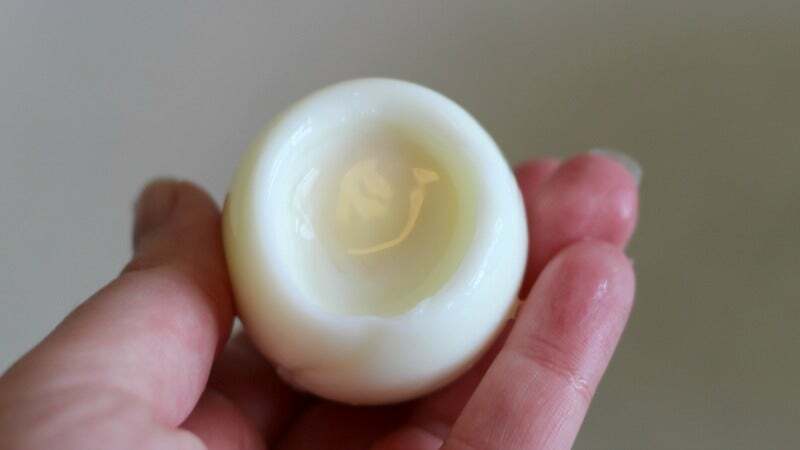 The cold water boil works perfectly, as long as you remember to prick the bottom of the egg. Did this last night and shells came off without issue.